All reports coming in about our trails are pretty good considering we have not sen snow for a couple weeks until yesterday. The groomers have been out and doing their magic. There are some areas that are still icy especially around the curves but with the recent snow, things should improve. We are also hearing that there is a lot of wildlife out there, deer and moose so use a bit extra caution and keep your eyes open. 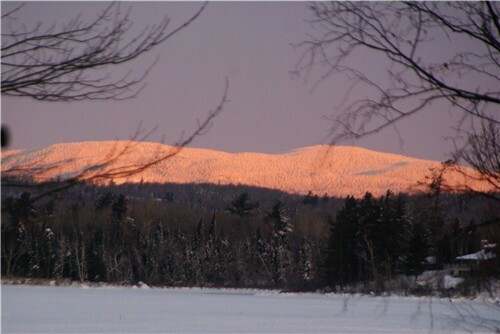 As the sunrise hit Bald Mountain…a view like this makes you glad to be alive. It is a cold, minus 15, but sunny day in Jackman. Ice fisherman are out on Big Wood and the snowmobiles are humming.